Amy, let go of his tail. I think Sonic likes it. I wouldn't say she's stronger, I like to think they're on par. I LOVE YOUR ART!  I would really like to draw like you ! You really have a great talent ! I hope you will make a much greater career for years to come! That must hurt, being pulled by the tail like that! Amy, let go of Sonic's tail, please! Me: Amy let him go! Amy: I am NOT letting you go this time! And all the feels ; funny, awkward, cuteness. And the warmth of the drawing really makes me smile and giggle. sometimes I forget that Sonic even has a tail. Sonic: Amy! Tail tail tail!!! 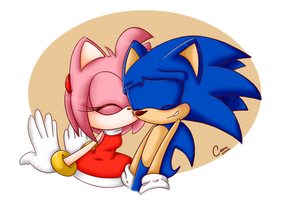 Amy: Say what ever you want Sonic but I am NOT letting you go this time! Me: Let go Amy or I'll pull at your tail! Amy: There's no use trying to break free, Sonic. Sonic: Aw come on, Ames. That's my tail you're pulling at. Me : what did you do this time sonic?! Sonic : nothi !!! "NO! NO! I DON'T WANNA!" She's probably forcing him to go to the mall... or to take swimming lessons!!! Bien por Amy. ya era hora que pusiera al bobito de Sonic en su lugar.